Imagine if you could simply melt your double chin away. With Kybella, this possible. Kybella treatment uses a syringe (not a scalpel!) to diminish submental fat and help those with double chins restore contour to the lower part of their face. What is Kybella, and what are its benefits? Kybella was first approved by the FDA in 2015 and has since been used safely and successfully on those seeking a non-surgical method of removing their double chin. 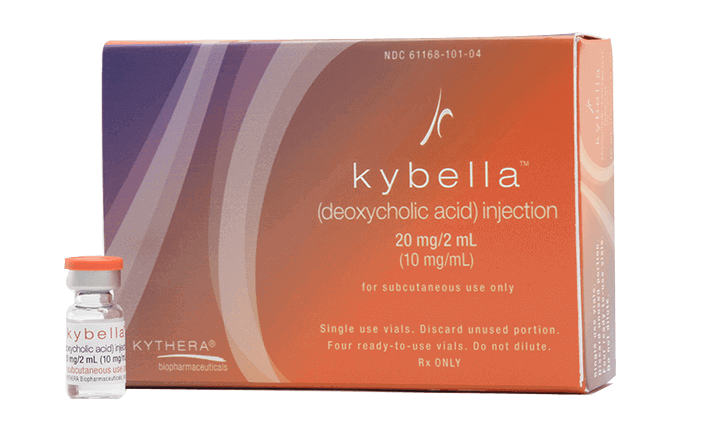 Kybella is a synthetic formulation of deoxycholic acid, bile found naturally within the intestinal tract. Deoxycholic acid plays a role in permanently destroying fat cells. When injected into the skin beneath the chin it dissolves the membranes that encompass fat cells, causing them to release their contents. The body then expels this waste product. Once fat cells have been destroyed, they will not return. Those who have undergone Kybella report that the treatment not only removes subcutaneous fat cells beneath the chin but also tightens the skin. As healing occurs, neocollagenesis (the creation of new collagen) is kickstarted. Increased collagen production in the treated area results in firmer skin beneath the chin, creating a subtle lift. Kybella is delivered by injections in the submental area (beneath the chin). Before the procedure begins, your injector will carefully mark out the injection sites in a grid-like format. A topical numbing agent or ice pack is provided to minimize any discomfort and prepare the area for the injections. Most patients receive 20-30 injections in one treatment, but some receive up to 50. Over the coming weeks, the acid works gradually to eliminate fat cells. The number of procedures required depend on the individual, with most people requiring between 4 and 6 sessions to achieve optimal results. You will need to allow for at least one month between treatments. When do results show and how long do they last? Results start to become visible after four to six weeks and will last indefinitely. Once fat cells have been eliminated from the body, they do not regenerate. The remaining fat cells, however, can still expand with weight gain. It’s therefore vital that you maintain a relatively stable weight. Some individuals may benefit from touch ups every year or two. As a non-invasive treatment performed without local or general anesthetic, Kybella carries less risk than surgical procedures. However, there is still a chance you may experience mild sild effects as a result of treatment. Some Kybella patients notice slight discomfort as a result of the injections. In the days following the procedure, swelling, bruising, redness, or numbness may be noticeable. These side effects should subside after one to two weeks. There is a very minor risk of more serious complications as a result of treatment with Kybella. Some individuals experience facial muscle weakness, an uneven smile, difficulty swallowing, or nerve injury in the jaw. Be assured, however, that in the hands of one of our expert injectors, the risk of such complications occurring is minimal.